The stakes are indeed high: The BJP’s only “poster boy” is Prime Minister Narendra Modi, who went on a desperate ribbon-cutting spree across Gujarat during a recent his two-day tour, followed by Congress vice-president Rahul Gandhi’s visit,which seemed to have drawn huge crowds in rural and semi-urban areas. Thanks to the relief to provided by the Election Commission of India, which appears to have decided to postpone imposition of the model code of conduct till at least October 25, not only has the BJP announced more sops, Modi is all set to address a major rally on Monday near Gandhinagar, with targets given to government officials and cops to mobilise around 10 lakh people. Critics say, Modi's attack of a man who brought together OBCs, Dalits, minorities and tribals under his famous KHAM (Kshtriya, Harijan, Adivasi, Muslim) theory suggested that he was getting increasingly frustrated, as he found the BJP was losing support from sections which had previously backed the BJP, especially OBCs, Dalits and Patels. BJP chief Amit Shah's target of crossing 149 seats of Solanki, whose son now is president of Gujarat Congress, seemed to him to have have further dimmed. 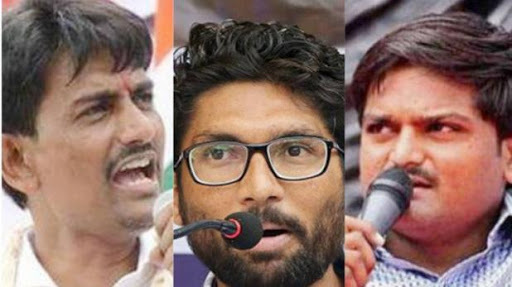 All this has happened, according to political circles, when the BJP’s efforts to woo other backward class (OBC) leader Alpesh Thakor, who has considerable influence among the numerically strong OBC Thakors of North Gujarat, are coming to a nought. The incident came amidst uproar among Dalits, as two youths of Limbodara village of Gandhinagar district were attacked on two separate days for sporting moustaches similar to those of upper caste Rajputs. PM Canvassing in a big way in every State Election is Not good for Office of PMO that should be above Party Politics. Excellent Rajivbhai! But I m deeply worried for Jigneshbhai! Although he is strategical , knowledgeable enthusiastic and doing well, our own people are blaming him for one or another reason. This I disappointing.